Wisdom of the Hands: what do the girls do? A reader asked what the girls were doing while the first grade boys made sail boats. That's a good question. It was long assumed that woodworking was for boys and that other things were for girls, and never the twain would meet. 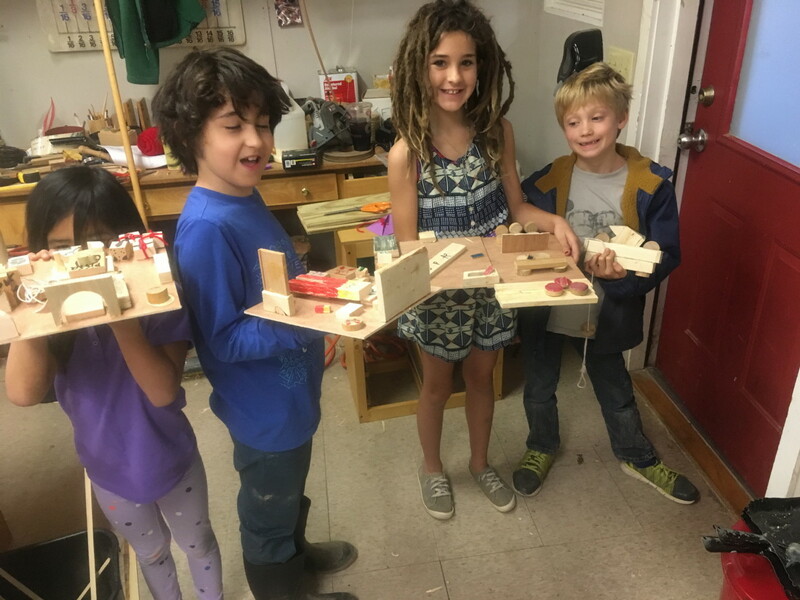 And yet, wood shop at the Clear Spring School is a gender equal opportunity. This year at the Clear Spring School I have a bumper crop of first grade boys and the decision was made to keep them in a group as they are all at the same level (generally) of skill and maturity. Also, I have a limit on class size, so breaking students into groups was required. The first grade girls were grouped with the older kids, grades 2, 3 and 4, due to their operating on a more mature level. 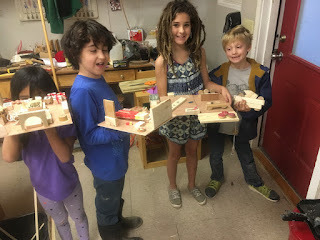 They have been skill building through making things that come more from their own imaginations. The photo shows some of the projects they carry home from a day in the wood shop. The girls had been offered the opportunity to make boats, and declined in order to carry on with things from their own interests and imaginations. Please allow me to assure you as well as my gentle reader, that the girls are never excluded from the opportunities that woodworking provides, for the development of character and intellect. In fact, the girls at the Clear Spring School have always been bright stars in the Wisdom of the Hands program, and will never be brushed aside. Start with the interest of the child! I think it is a very fine idea to split up the class so all the children are more at the same level. And there are few things that are so helpful in education as being allowed to work on something in which you are interested. The furnished rooms that they are holding looks like they have really given some though as to how they should be decorated and what furniture should be there.